We have established a developmentally appropriate curriculum based on a child’s intellectual, social, and physical needs and which is designed to encourage child-initiated learning activities within a supportive environment. Our modern teaching philosophy incorporates the best of the European Kindergarten model with the American school. The KinderHaus is an inquiry-based environment that supports children’s development of problem-solving and creative thinking skills where activities and projects derive from children’s interest and experiences. KinderHaus teachers share the philosophy that children are actively engaging with their environment and are curious about the world around them, ask questions and construct own knowledge through investigation and exploration. We believe that children’s play is an expression of intelligence and growth and that social interactions promote a child’s healthy development. The emergent curriculum is based on children’s input and interests as well as seasonal observations and cultural festivities. In the classroom, teachers use project-based learning to support children’s cooperation during interdisciplinary activities, related to math, science, art, language, movement and music. KinderHaus children develop a love for learning, gain independence and confidence in their own abilities which KinderHaus values as the strong foundation for learning in the primary grades. 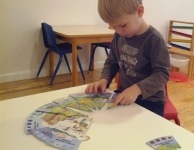 KinderHaus children become curious, motivated and competent learners. The curriculum offers children activities and materials that stimulate imagination, build independence, and present ample opportunities for exploration and discovery. Through a wide range of activities we help children gain confidence as they become competent learners, adapt to group experiences, and learn to respect the feelings of others. We believe that children’s play is an expression of intelligence and growth, and that young children learn best through hands-on, concrete experiences. Learning is both an individual and a social process. Young children are excellent language learners when given the chance for a consistent and early exposure through native speakers. KinderHaus teachers put a strong focus on language aquisition and support each child’s language development. The KinderHaus German Immersion environment enables children to become confident in their ability to speak and understand the German language, converse about developmentally-appropriate school topics, experience aspects of German community and culture while learning in a warm and caring environment. The KinderHaus parent community is an important, vibrant and diverse partner in children’s multilingual upbringing that supports the children in becoming the future global citizens. By learning German, we are adding countless opportunities to children’s lives that includes many benefits for personal and professional growth. Regardless whether or not one of your home language(s) is German, parents can support the language journey of their child by sharing an encouraging attitude towards the German language and culture. KinderHaus truly embraces the different linguistic and cultural backgrounds within our community and celebrates the diversity that becomes visible in our curriculum and classroom. KinderHaus teachers share the belief that young children benefit greatly from building a strong connection to nature and during daily outdoor experiences, we seek to implement a love and respect for nature and a compassion towards animals and our environment. Based on the understanding that children thrive in all developmental areas through close experiences with nature, KinderHaus follows a seasonal curriculum which includes outdoor times in all types of weather. Spending time in nearby Prospect Park or the backyard allows teachers and children to take learning to a higher level, collaborating on communal goals when building and crafting with natural items and building self-esteem and independence while being physically active outdoors.